The GOP, Race and Ted Nugent: If you won't Denounce Nazi Insults, What does that Say about You? 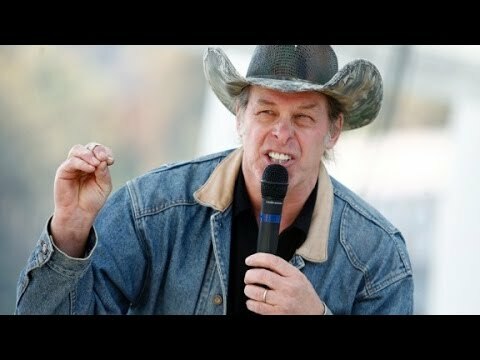 The GOP, Race and Ted Nugent: If you won’t Denounce Nazi Insults, What does that Say about You? Musician Ted Nugent called President Barack Obama a ‘subhuman mongrel.’ He has not been denounced for this language by Greg Abbott, the Republican who wants to be the next governor of Texas, though Abbott brought Nugent along on two campaign appearances. On Friday, Nugent “apologized” (though “not to president Obama”) for using the language insofar as it embarrassed other Republicans associated with him. That is, he did not actually apologize at all. Sarah Palin said of Abbott, “if he’s good enough for Ted Nugent, he’s good enough for me!” Sen. Ted Cruz, quizzed on Nugent’s language, replied that he was sure that President Obama’s Hollywood friends had also said some extreme things. Really, Ted? This comment is just “extreme”? And which liberal in the film industry has said anything like that? The fact is that the Republican Party today has a problem with race. Not across the board, but it is there. The Party is is disproportionately made up of self-conceived white southerners with some white Midwesterners and westerners, allied with Wall Street big money. It has even lost the majority of Asian-Americans and Arab-Americans, and can’t get even a plurality of Latinos or more than a handful of African-Americans (traditionally Republicans before the 1970s) to vote for it. The Tea Party and other currents in the party often express white male rage about the rise of the minorities, and the party’s refusal to consider immigration reform is rooted in that rage. Although a few Republican figures such as John McCain and Rand Paul have condemned Nugent, most have kept quiet, as has Abbott himself. Mostly it is bad form to bring up the German National Socialists in contemporary political debate, to the point where there is a rule, “Godwin’s law,” that mentioning Nazism is a sign that an internet dispute has gone on too long. Godwin’s law did not specify that mentioning Nazism causes the mentioner to lose the debate; that was a principle put forward in 2007 by The Economist. In general, I agree, and discourage my commenters from resorting to Nazi analogies. But in rare cases someone does or says something that is clearly Nazi in character (e.g. the Neo-Nazis themselves). Calling an African-American politician “subhuman” and a “mongrel” is not ordinary everyday garden variety racism. Deploying stereotypes would be racism. As CNN’s Wolf Blitzer observed, this is Nazi terminology, and was applied by the Nazis to Jews. Nugent’s phrase is straight from Mein Kampf. If Republicans such as Abbott and Palin won’t denounce this language, then the GOP has a much bigger race problem than even its most trenchant critics could have imagined. Not only are people actually all mixed up, 5% of our genes are from the Neanderthals, a different species of the human genus! (Most Africans lack this heritage, since the mixing with Neanderthals happened in Eurasia after some homo sapiens sapiens left Africa around 70,000 years ago; but since some Eurasians wandered back down into Africa, some Africans do have Neanderthal heritage as well as Eurasian heritage). Since all contemporary human beings are descended from African progenitors who lived 120,000 to 200,000 years ago in South Africa, all of us have black ancestors. White skin is an adaptation to low ultraviolet ray levels in northern climes, since it produces vitamin D deficiency. (In South Africa, black skin protects against too high UV ray levels, which can damage fetuses). But humans couldn’t live up in northern Europe during the last glacial maximum, roughly the period 40,000 to 13,000 years ago. So the humans who went back into Europe at the end of the last big glaciation were black, and the desirability of lighter skin to let the UV rays through to fetuses for vitamin D production gradually selected for lighter and lighter skin. But as recently as 7,000 years ago, humans inhabiting Spain had black skin along with, sometimes, blue eyes. Get over it, white supremacists. Great-grandma was African. All Europeans probably have a common ancestor as recently as a thousand years ago. All Europeans have some recent Near Eastern and black African inheritance via Umayyad Spain, with its Berbers, Arabic-speakers, and soldiers and slaves from West Africa, not to mention an older inheritance from the Phoenicians. Archeologists found Chinese laborers in Rome 2000 years ago, and I guarantee you that all Europeans have some genetic inheritance from those guys, assuming they had children with other slaves. As genetic history develops as a discipline, we are finding people of African heritage in England, of European heritage in China, etc., etc. Even Hitler had Sephardic Jewish ancestry from North Africa. Americans don’t think that different peoples are better or worse one than the other. We don’t have a racial hierarchy. For one thing, we are too mixed up to understand ourselves as “racial” in the Nazi way. Our “Slavs” intermarried with our Teutons. None of them is more or less human, they’re all human at the same level. If we can only finally get rid of the stupid, invented category of “white” (pushed by Catholic Europeans who wanted to join the Protestant elite), we’ll be much better off. President Obama is a typical American, not exceptional. But more, he is a typical human being. Fox Cable News, a.k.a Republican Party Central, has largely declined to cover the Nugent scandal, and only Bernard Goldman has denounced the language he used. If Greg Abbott won’t explicitly dissociate himself from Nugent, after publicly campaigning with him, then he doesn’t deserve to be governor of Texas, because he is behaving in an un-American way. Nugent wraps himself in the flag, but lifting language from America’s greatest enemy is not patriotism. Millions of Americans risked their lives to fight this ideology. One of my uncles was at the Battle of the Bulge. This is not a case of a rocker acting out. It is treasonous.